The Wright Rain range of aluminium pipes and fittings are known all over the world for their superior quality and durability, and have become the industry standard for many applications. Their light weight, strength and corrosion resistance makes them ideally suited for portable irrigation systems. 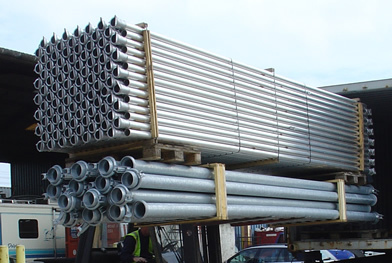 The aluminium pipes are manufactured from the highest quality alloys which combine high corrosion resistance with a minimal denting factor. Cast aluminium female couplers are seam welded by the Argon Arc process to one end of the pipe and fitted with a high quality rubber seal prior to despatch. The male end of the pipe is rolled to provide a strong smooth spigot, to which the aluminium band and hook assembly can be fitted on delivery. In addition to Mainline pipe for water transfer, the range includes Valved pipe with an integral hydrant outlet on the female end which incorporates lugs for attaching a stabilising batten. Valve elbows from the fittings range are used to connect the hydrant tops to branch lines, sprinkler laterals or hose-reel irrigation machines, and turn them on and off. Sprinkler pipes have a 1″BSPf outlet for fitting a sprinkler riser pipe on the female end with an apron that can be drilled for attachment of a stabilising batten if required. Apron pipe can be used between lengths of sprinkler pipes to increase the spacing between sprinklers. 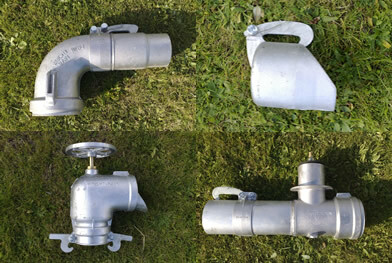 The range of aluminium fittings also includes extended valve elbows for connecting to hydrant tops in chambers below ground level, 45° and 90° reversible bends, reversible side tees, end tees, reducers and increasers, end plugs, male and female couplers with hosetails, flanges or bare male and female couplers can be supplied as spare parts for self fabrication.